This simple filled concrete arch appears to be a replacement for an earlier stone structure. At the southern portal above Riverview Rd, a section of an older wingwall protrudes to the west high on the embankment. The dozen or so cut stones which are visible feature stonecutters' marks similar to other bridges built around 1890-1900. The embankment that isolates Shousetown on the Ohio riverbank from the rest of Crescent Twp appears to have been widened for double tracks, but only a single track remains. There are some natural layers of sedimentary stone in the area below the stone wingwall -- indicating a combination of cut and fill to separate the road and railroad. And it appears that the construction of the concrete current tunnel was probably tied to the double-tracking of this rail line; the embankment seems to have been widened toward the river. Most of the concrete has been resurfaced with a layer of shotcrete. As the road passes below the railroad, a culvert carrying Spring Run passes below the road. It looks like a tunnel under a tunnel. 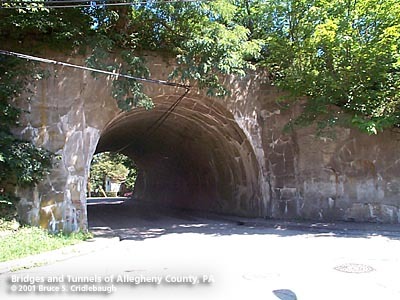 The railroad crossing over this tunnel was built as the Pittsburgh & Lake Erie Railroad, now part of CSX. The P&LE was chartered in 1875 to build a line from Smithfield St on the South Side of Pittsburgh to Haselton, OH (about one mile southwest of Youngstown). The line was in operation in 1879. In 1880, the P&LE acquired the Pittsburgh & Becks Run Railroad Company which gave it a connection to the Jones & Laughlin American Iron Works on the South Side. In 1907, J&L purchased 700 acres of riverfront property including the Woodlawn amusement park; the Alliquippa Works and the town which grew up around it added to the P&LE traffic. The Pittsburgh & Lake Erie Railroad was controlled by the New York Central in 1889. The NYC merged with the Pennsylvania Railroad in 1968 to form the Penn Central which went bankrupt after two years. The P&LE became independent at that time and avoided becoming part of Conrail in 1976. In 1991 and 1992, CSX bought the remaining assets of the P&LE -- continuing to operate this line along the left bank of the Ohio River. Now known as Glenwillard, Crescent Twp, this small town was laid out by Peter Shouse as Shousetown. Most of the land as the Forks of Flaughterty Run was owned by James O'Hara and William Woodburn. The latter became a resident in 1794. Shouse was born in Reading, PA in 1788 and moved to Pittsburgh to work in the growing ship-building trade. There he was involved in the construction of the "New Orleans," the first steamboat to float on the Ohio River. He assisted in the building of Perry's fleet that led to victory on Lake Erie in the War of 1812. Upon returning from service, he settled in Elizabeth, PA, on the Monongahela River, where important ship-building works had been established. Sources differ on the date when Shouse moved to the banks of the Ohio River (1822, 1826) and when he laid out the town of Shousetown (1826, 1837). Cushing states, "The depth of the water was greater then, and the present location of the sandbar in front of the town was marked by a pool eighteen or twenty feet deep, thus presenting exceptional facilities for launching boats. The country for miles inland was covered with forest, and every variety of timber was thus conveniently available. Between two and three hundred men were usually employed at the yards, and others were engaged in the forest preparing timber. A large number of steamboats and other varieties of river craft were built, of which the Algonquin, Red River and Mohican became famous for their speed. The business was continued with uninterrupted success by Mr. Shouse until 1857, when he was succeeded by Ezra Porter, Nathan Porter and Samuel Shouse, by whom it was continued for some years. The timber in the vicinity has disappeared, and other conditions unfavorable to a continuance of the boat-building industry at this place have come into existence; and after gradually declining, the building of boats was suspended in 1873." A nearby park features memorials to the shipyards and a monument depicting the "Great Republic," the last vessel constructed here. A pair of commemorative pylons holding bronze plaques were erected by the County of Allegheny in 1934 when the road along the left bank of the Ohio River was rebuilt as McGovern Blvd. The pylon at Riverview Rd mentions Peter Shouse and James O'Hara, and marks the road project. Charles McGovern was chairman of the county commissioners at the time. The second pylon is near the western end of Shousetown. A low stone enclosure marks the cemetery where many of the early inhabitants were laid to rest. The individual graves are not marked, but the text of the bronze plaques honor the historical significance. States Army at Pittsburgh, PA.
Site Which Later Became Shousetown.